But another year has gone by and the market still seems to be inching along. Though telemedicine seems like a no brainer, it still faces many hurdles. Some players in the urgent care and retail clinic space have taken a stab at telemedicine, most under the radar with pilot programs. Some have exited, calling the market a hornet’s nest. Others say it’s more a matter of not getting too far ahead of the curve as patients get their heads around this new modality. If telemedicine is like red wine, it’s going to be really good by the time it reaches maturity. But it's more than just the acceptance factor with patients. Until recently, there have been wide differences between states in terms of regulating telemedicine, making it difficult for national players to emerge. Payer policies have been slow to develop and fee schedules make it difficult to justify anything more than small test programs. Although pricing for devices has come down, integrating them so they work seamlessly is easier said than done. Many companies in this industry are venture backed. This is no different than the dot com boom. Eventually the funding well runs dry and start-ups will have to force themselves to a cash-positive position or go out of business. When the high-profile kiosk vendor HealthSpot closed its doors in late 2015, it sent shivers through the industry. So are things improving? Are we any closer to a momentum swing for telemedicine? Below are a few observations on the roadblocks that have kept this industry from reaching full potential and some positive signs that those barriers are being removed. Two developments have given rise to a sense that we have crossed a milestone when it comes to a more standardized set of state regulations across the country. First, in April 2014, the Federation of State Medical Boards (FSMB) passed a resolution called the "Model Policy for the Appropriate Use of Telemedicine Technologies in the Practice of Medicine." Until that resolution, there was no consensus on how to approach telemedicine from a regulatory standpoint. Subsequent to the adoption of that policy, a number of local medical boards began working at the local level on legislation around telemedicine. Second, last month the state of Texas passed its first telemedicine law. Many believe Texas is a watershed state because of its size and political complexity. In other words, if Texas can do it, there is no excuse for the rest of the states, with perhaps the exception of New York and California. "It's getting there," says Sidney Welch, a shareholder at the law firm Polsinelli and chair of the firm’s Health Care Innovation group. "It can be a slow process, but the FSMB compact means we're starting to see less variation." What is the policy around establishing a patient relationship before a telemedicine visit can take place? What types of providers can deliver telemedicine and should the provider be licensed in the state where the patient is or where the provider is? Should health insurance companies be required to cover telemedicine visits? Must telemedicine visits be held in real time versus using "store-and-forward" technology like email or questionnaires? The FSMB essentially says that a provider can establish a relationship with a patient at the time of the telemedicine visit, although there are specific guidelines around what must be done to establish that relationship, including clear provider identification, informed consent, and access to medical records. There is now consensus that the provider must be licensed in the state where the patient is physically. FSMB discourages the use of store-and-forward technologies but does not expressly call for the prohibition of these. And there appears to be developing consensus that health insurance companies must cover telemedicine visits as they do with any in-person visit, though parity on fee schedules has a long way to go. But the development of more consensus doesn't mean it is all smooth sailing, according to Welch. "At first blush it looks easy once licensure starts to standardize but there are still bits and pieces of state statutes and regulations affecting telemedicine delivery that are on a one-off basis," she says. "Turn up one rock and it leads to another." The FSMB policy can be found on their web site. The HealthSpot receivership incident in late 2015 was a wake-up call because the company was so high profile. But what made HealthSpot so visible was the space age appeal of its kiosk not its selection of target markets or appropriate use of funding. Granted, HealthSpot did land some high-profile deals that got lots of press, but it was mostly because it was a good visual story. The big surprise is that the HealthSpot concept is not completely gone. Last year a subsidiary of Rite Aid, retail clinic operator RediClinic, acquired the assets of HealthSpot, including more than 100 kiosks that are now sitting in a warehouse. This development is instructive on a number of fronts. First, the slow development of telemedicine adoption looks eerily similar to the slow development of retail clinic adoption during its first decade of existence. Many people forget how many casualties there were in the retail clinic market before a handful of survivors emerged. Web Golinkin, CEO of RediClinic, is one of those survivors. "There's no question in my mind that telemedicine is going to be an important part of the future," he says. "The trajectory is similar to what we saw with retail clinics in terms of consumer acceptance, payer support and state regulations, but the technology adds another dimension. There are many examples of technologies and technology-enabled products and services that treaded water for many years and suddenly took off, and this could be one of them." Golinkin says he thinks the telemedicine market is reaching some kind of inflection point. Tom Pascuzzi, M.D., is Merchant Medicine’s lead telemedicine consultant. He says there are also generational factors that favor telemedicine. But as Golinkin says, for now there is a technology element here that needs special attention. There is no argument that telemedicine technology has a come a long way, both in terms of quality and price. You can buy the main elements of a high-quality telemedicine cart on Amazon today for well under $5,000. The challenge is getting all of those devices to work together, not to mention integrating them into an electronic medical record system. But it’s also deploying that technology in a way that makes patients feel comfortable. Think about how the airlines deployed check-in kiosks. In the early going there were lots of airline employees out front helping customers with the check-in process. That’s another piece that makes RediClinic’s acquisition of the HealthSpot assets intriguing. “Device integration is really important,” says Golinkin from RediClinic. "It's a great use of technology because it enables us to replicate an in-person visit, which fosters high-quality care and expands the scope of telehealth practice. But you have to have someone to hand-hold patients through the process at this point." 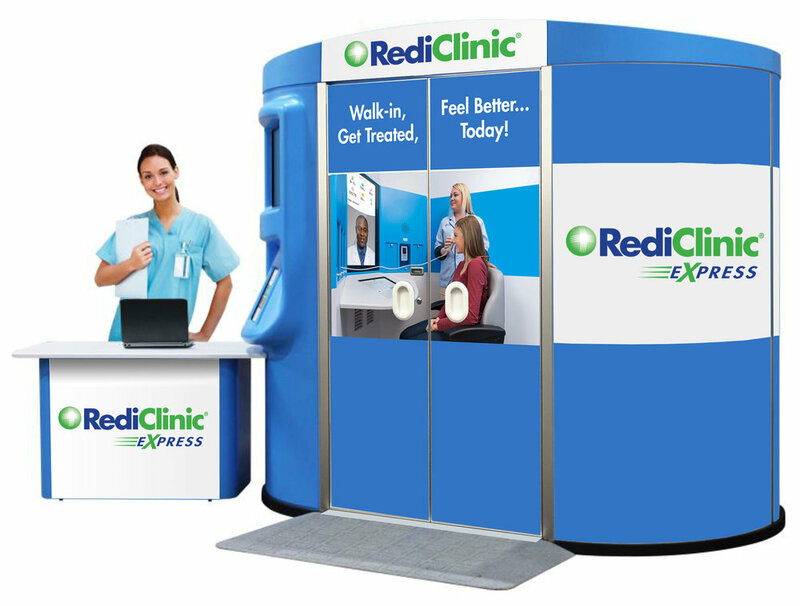 RediClinic will begin deploying the HealthSpot (rebranded as RediClinic eXpress) kiosks later this year in Rite Aid stores and employer sites, working predominantly with health system partners, payers and self-insured employers. Unlike the earlier HealthSpot deployments, which expected patients to figure it out themselves, each kiosk will have an attendant to orient the patient, administer lab and diagnostic tests, help them with the devices and handle payment processing. The other approach to telemedicine has nothing to do with carts or kiosks. It’s the pure online approach for patients seeking care from their home, hotel room or work site. American Well and Teladoc are the largest integrated telemedicine platforms taking aim at this slice of the market. Both are a kind of one-stop shop for telemedicine solutions that includes the technology and provider networks. Now the question is what scope of service or specialty care you do these firm go after. American Well is probably the best illustration of diversification on target markets. Not only does the company target acute episodic illnesses, but also behavioral health and weight loss. The big advantage of this online approach is the ability to deliver care or therapy on nights and weekends, or even over a lunch break while at work. Mention the slow pace of telemedicine and you will likely hear that health insurance companies are at the center of that slow pace. That is ironic since many large payers, like UnitedHealthcare/Optum and Anthem, have active telemedicine programs themselves. But payers have always struggled with competing forces when it comes to disruptive initiatives. On the one hand, disruptive innovation in health care tends to save money for health plans on their fully insured business. Health plan CFOs like this. But on the other hand these initiatives are a threat to the providers that make up health insurance provider networks. Disruption of provider networks is bad for health insurance companies because members end up either losing their preferred physicians or changing insurance companies. Because of this, employers are especially sensitive to high provider turnover. So health plan network management VPs and medical directors don’t like this. Many experts believe this is the number-one impediment to widespread telehealth adoption. Many of large organizations do have payers agreements now, driven in part by new parity laws. But there not yet parity when it comes to fee schedules. Reimbursement for telemedicine visits is typically much lower than an in-person visit. Golinkin from RediClinic says that when talking about payers, it’s important to remember the self-insured employer. In the same way self-insured employers pushed the retail clinic concept with insurance companies, so too they are pushing telemedicine. There is no doubt that the telemedicine market has made major progress in terms of awareness, regulations and reimbursement. But next year at this time will we still be saying telemedicine is on the cusp? Are we missing something? That something may be simply too many players chasing a limited number of visits. After all, in addition to telemedicine vendors, the available market for acute episodic visits has other big players taking aim, including retail clinic operators like CVS, Walgreens, Kroger and RiteAid; work site clinic operators like QuadMed and Premise Health; and national and regional urgent care operators. The disease management market is being sliced up by hundreds of startups, as are the various specialty and subspecialty markets. But in the end disruptive forces end up sorting themselves out, especially when it comes to technology. Out of the chaos surrounding the dot com bubble bursting in 2000 came the likes of Google, Amazon and eBay. Doug Johnson is another Merchant Medicine consultant on telemedicine projects. He says the companies who focus on the business case are the ones who will be successful. Johnson says organizational strategy and success goals are the prerequisite of telehealth implementation. Kaiser Permanente is one organizations that seems to be having organizational success. Last October Bernard Tyson, the company’s chairman and CEO, shocked an audience at the Salesforce.com Dreamforce conference in San Francisco when he revealed that of the 110 million people seen last year by the staff model HMO, some 59 million connected through online portals, virtual visits or the health system’s apps. He said that accounted for 52 percent of total visits. Ultimately, what consumers have grown accustomed to in other industries, such as instant access and high customer service, will help drive telemedicine adoption. It’s a slow process, but all indications are that telemedicine eventually will be a tool that proliferates most types of medical care. The players who dominate that space is still very much up in the air.